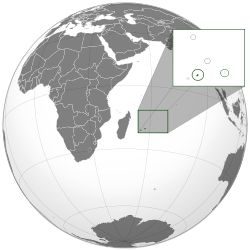 "Starn an Key o the Indie Ocean"
Islands o the Republic o Mauritius labelled in black; Chagos Archipelago an Tromelin are claimed bi Mauritius. The mither tongue o Mauritians (2011 Census). Mauritius (/[unsupported input][unsupported input]məˈrɪʃəs/; Mauritian Creole: Moris; French: Maurice, pronounced [mɔˈʁis]), offeecially the Republic o Mauritius (Mauritian Creole: Republik Moris; French: République de Maurice) is an island naition aff the sootheast coast o the African continent in the soothwast Indian Ocean, aboot 900 kilometres (560 mi) east o Madagascar. 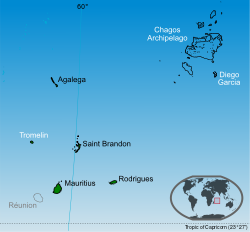 In addition tae the island o Mauritius, the Republic includes the islands o Cargados Carajos, Rodrigues an the Agalega Islands. Mauritius Island is pairt o the Mascarene Islands, wi the French island o Réunion 200 km (120 mi) tae the soothwast an the island o Rodrigues 570 km (350 mi) tae the northeast. The Breetish teuk control durin the Napoleonic Wars an Mauritius became independent frae the UK in 1968. Mauritius's aurie is 2040 km2 wi Port Louis for caipital. It is a parliamentary republic an is a member o the Soothren African Development Community, the Common Market for Eastern and Southern Africa, the African Union, La Francophonie an the Commonweel o Naitions. Mauritius haes an upper middle income economy. The main leids spoken in Mauritius are Mauritian Creole, French an Inglis. Inglis is the ae offeecial leid but the lingua franca is Mauritian Creole an the newspapers an televeesion programmes are uisually in French. Rodriguan Creole an Mauritian Bhojpuri are minority leids an, in the case o Rodriguan creole, spoken in certaint pairts o the kintra anerlie. In terms o the ethnic composition o the kintra, the population is componed o fowk o Indian, African, Cheenese an French ancestries. Thare wur nae indigeneous fowk livin on the island. The island o Mauritius is renowned for haein been the ae kent hame o the dodo. This bird wis an easy prey tae settlers due tae its wecht an inability tae flee. It became extinct less nor aichtie years later. ↑ The Mauritian Constitution daes nae mention ony offeecial leid, anly Section 49 mentions that the offeecial leid o the Naitional Assemmly shall be Inglis, while French mey be used. ↑ "Republic of Mauritius, Government Portal (Mauritius)". Archived frae the oreeginal on 10 May 2011. ↑ 3.0 3.1 3.2 3.3 Statistics Mauritius. "2011 POPULATION CENSUS – MAIN RESULTS" (PDF). Government Portal of Mauritius. Retrieved 11 November 2017. ↑ Statistics Mauritius. "Digest of Demographic Statistics 2013" (PDF). Government Portal of Mauritius: 22. Retrieved 28 January 2015. ↑ 6.0 6.1 6.2 "Report for Selected Countries and Subjects". International Monetary Fund. Retrieved 25 July 2014. ↑ "GDP per capita, current prices | IMF World Economic Outlook". EconStats. Retrieved 6 September 2016. ↑ "Coexistence International at Brandeis University" (PDF). Retrieved 2010-07-04. Wikimedia Commons haes media relatit tae Mauritius. This page wis last eeditit on 6 Januar 2019, at 16:38.